In October, 1988, my friends Janet Landy and Edward Hirsch flew to New Orleans to adopt a boy who was six days old. He was collected from the hospital by their lawyer, who brought him to the house where they were staying. Waiting for her, they stood in the street in front of the house. For several days, they worried that the mother, overcome by love or by guilt might want the child back, but she didn’t. Later in the piece we learn, “Hirsch had a cousin who was a lawyer in New Orleans, who put him in touch with the woman at his firm who sometimes handled adoptions. In August, 1988….the lawyer called and said that a young woman had approached a colleague.” This is all we are given regarding Gabriel’s birth and his birth mother, fitting perhaps since the story is about Hirsch’s grief and the book-length elegy the grew out of his suffering over the death of his son. But from my perspective as a birth mother, even as I followed the trajectory of Gabriel’s life and of Hirsch’s profound sorrow over the loss of him, a piece of my heart lay lodged in that first paragraph with the woman who had given up her son. Hirsch’s recognition that never ending grief over the loss of a loved one is a common experience connects the reader with an abiding truth, but I couldn’t help but wonder if he ever thought of the woman who might still imagine her son walking the earth, whole and healthy. She (and the rest of Gabriel’s birth family) has suffered a loss more terrible than his relinquishment, only she doesn’t know it. I do not mean to say that Hirsch’s grief is any less because his son was adopted. I don’t mean that at all. I just can’t help imagining a mother thinking daily of the boy she gave away, and how, now that he has rounded the corner of official adulthood, it might be a good time to search for him. Perhaps, even though she did not merit a mention in the New Yorker story, Hirsch does give her a nod somewhere in the elegy. I hope so. She has been carrying her bag of cement since Gabriel was six days old. 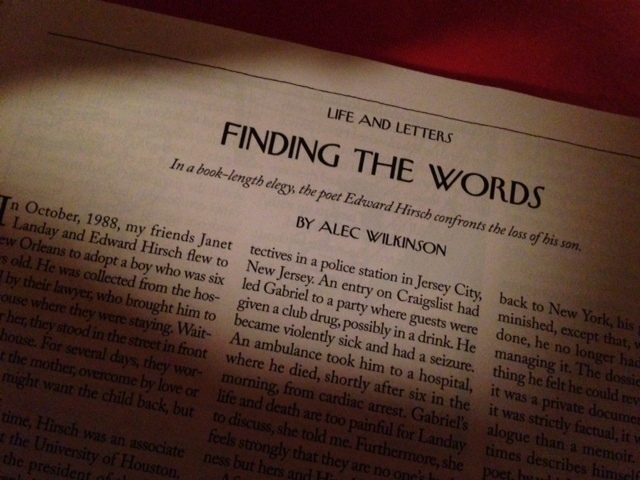 This entry was posted in adoption, adoptive parents, birth Mother, birthmother, grief, poetry, Uncategorized and tagged adoption, adoptive parents, birth mother, death, grief, loss, poetry, The New Yorker on August 4, 2014 by declemen. You know, quite unbelievably, I have never considered quite this scenario. How could I not have? A woman gives up a child for adoption and doesn’t know he has died. This is more heartbreaking than I ever could have imagined. Perhaps that’s why I never imagined it. Just stunning. I will be thinking about this all night. I read this and actually thought of you, of the birth mother, etc. You have influenced me deeply, Denise. Denise, I am just heartbroken at reading this, also, I am somewhat confused, so will ask this question, “Are you the birth mother of Gabriel?” If the answer is “No”, there is a possibility I may know who his birth mother is, so PLEASE reply ASAP! Before he died, Gabriel talked about searching for his birth mother and was encouraged by his family to do so. But it wasn’t a priority for him. While he was curious about his birth mother, he wasn’t driven to find her. Nor is it clear whether it would have been in anyone’s best interest for him to do so. Gabriel was born with a host of neurological and developmental problems which doctors believed might be attributed to the fact that his birth mother drank alcohol and used drugs throughout her pregnancy. While it is possible that she grieved for the son that she gave up for adoption, it is also true that she left the hospital immediately after giving birth to her son — without naming him or waiting for his adopted parents to return from Rome where they were on sabbatical for the year. As a result Gabriel spent the first six days of his life in a hospital under the watchful eye of nurses until his adopted parents could arrange for an international visa and bring him back to Rome with them. This post is not intended as an indictment of birth mothers, many of whom no doubt suffer greatly when they give up their children. But when a birth mother continues to drink and use drugs during her pregnancy without regard for the damage that she is doing to her child, it’s hard to muster up too much sympathy for her grief. I wish that this birth mother had met Gabriel so that she could see firsthand the damage that her behavior caused to her son — damage that greatly compromised his ability to live a healthy, satisfying and productive life. It was common for mothers whose children were to be adopted not to name the child. In fact, I’m one of the few mothers I know who did name her child. Birth Mothers were not asked to name their children and many believed they they were not allowed to. Birth mothers left the hospital when the doctor discharged them. They could not stay longer without incurring great expense and it’s unlikely that Gabriel’s birth mother had any money. Once a mother signed a consent, usually soon after birth, she was out of the picture and had no authority–or believed she did not–to do anything with respect to the child. As far as Gabriel wanting to meet his birth mother not being a priority — it’s common for adoptees to minimize their desire to know their story and meet their birth family to avoid hurting their adoptive parents. Edward Hirsch and Janet Landay could have taken it upon themselves to meet Gabriel’s birth mother which might have helped them understand Gabriel. Apparently this never occurred to them.